The start of round four in Skopje. | Photo: Patricia Claros/EICC2019. Maxim Rodshtein (Israel), Ferenc Berkes (Hungary), Kirill Alekseenko (Russia) and Kacper Piorun (Poland) are the only players on 4.5/5 at the European Individual Chess Championship in Skopje, North Macedonia. Saturday is the one and only rest day. The European Individual Championship is held for the 20th time this year. As always, it's an 11-round Swiss where 22 players will qualify for the upcoming World Cup in September in Khanty-Mansiysk. Another 23 players already qualified last year. With a first prize of €20,000 (U.S. $22,641), the European Individual takes place March 18-29 in Skopje, North Macedonia. 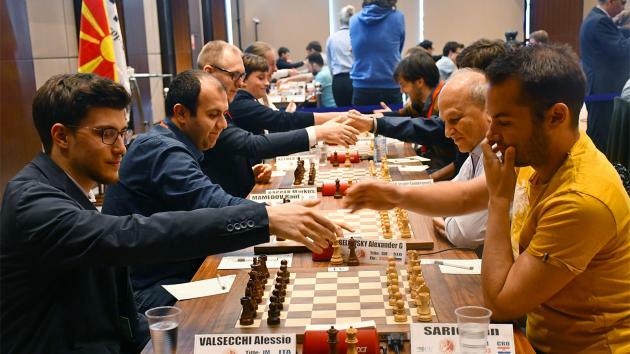 It is organised by the government of North Macedonia together with the Agency for Youth and Sport and the North Macedonia Chess Federation under the auspices of the European Chess Union. The tournament has six 2700 players: GMs Vladislav Artemiev (RUS, 2736), Evgeny Tomashevsky (RUS, 2705), Daniil Dubov (RUS, 2703), Vladislav Kovalev (BLR, 2703), reigning champion Ivan Saric (CRO, 2703) and Rauf Mamedov (AZE, 2701). All of them have dropped more than half a point already. The Double Tree Hotel in Skopje is the venue for the European Individual. | Photo: Patricia Claros/EICC2019. Top seed Artemiev drew twice, the last one in round five in just 10 moves. It's clear that World Cup qualification is top priority for most of the participants. The Russian rising star started with two nice wins, both of which involved an endgame where he successfully battled against the opponent's bishop pair with rook and pawns. To get that kind of endgame in two consecutive games is quite rare! And then, in a battle between the 2019 Gibraltar winner (Artemiev) and the 2019 Aeroflot Open winner Kaido Kulaots, something very similar came on the board! However, first we should check the early middlegame, because that involved two knight sacrifices, first on f7 and then on e6. It's an amazing game that deserves a (much) deeper analysis, that is clear. In any case, shortly before the time control the same endgame was reached, and Artemiev managed to win it again. Top seed Vladislav Artemiev with chief arbiter Ashot Vardepetyan at the drawing of lots during the opening ceremony. | Photo: Patricia Claros/EICC2019. Among the 25 player on four points there are two IMs. First, there's 23-year-old Klementy Sychev of Russia, who took his first big scalp in round five when he defeated Georgia's number one player Baadur Jobava as Black. Staying true to his style, Jobava played highly creatively, this time with some remarkable king moves. Wilhelm Steinitz would have been proud, at least for the first 24 moves. Another talented IM started well, with an undefeated 3.5/5: 18-year-old Max Warmerdam of the Netherlands. Dutch fans will surely know him; in January he promoted from the highest amateur group into the 2020 Tata Steel Chess tournament's challengers. Last month Warmerdam shared second place in the Batavia tournament, the one where the organizers experimented with blitz matches before every classical game. Instead of showing a game from Skopje, this little "bridge" gives us the opportunity to show the following, romantic blitz game Warmerdam won against Dutch GM John van der Wiel. The European Championship runs for six more rounds, starting Sunday. You can follow the games in our live section.